There is nothing particularly outstanding about Guts Casino’s offering to players; but there is very little wrong with it too. The site itself is a joy to work with, and they have utilised the tile-style way of listing their titles, which aids simple navigation and game location, plus a host of other smart menus to enhance the user experience. Most importantly, Guts Casino is a name you can trust. When it comes to investing your deposit and time in an online casino you need to know that – quite simply - you aren’t about to be let down by a lack of games, huge wagering requirements on bonuses or sloth-like withdrawal times. Guts is based in Malta as a subsidiary of owner Gaming Innovations Group, with licences earned from the UK Gambling Commission and the Malta Gaming Authority. The website is available in English, German, Swedish, Norwegian and Finnish. One of the keys to Guts’ success has been the partnerships it has forged with a number of the industry’s key software developers, including NetEnt, Microgaming, IGT and Betsoft. The outcome is that the slot games and casino titles supplied are diverse and appeal to a wider range of players. Whether you’re looking for contemporary, high octane action or classic, more considered gaming, you will find titles to suit at Guts. Touting such a quality lineup of providers means Guts players will never go without when it comes to topnotch slot titles. 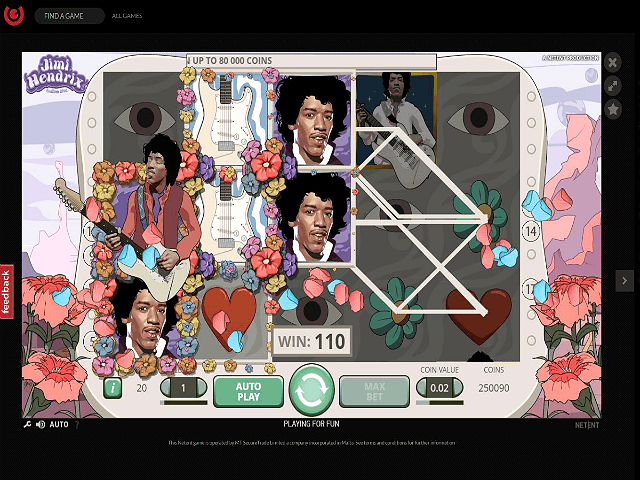 The emphasis at Guts is on instant gratification for its players, and that is achieved via the user experience on offer. The site navigation acts as the perfect wayfinder for those who know which game(s) they want to play, while for those a little unsure the handy search function will come to the rescue. Particularly helpful are the hot keys at the bottom of the screen; these lead players to featured games or those considered ‘hot’. There is even the option to star them too, which adds each title to your favourites folder. Site usability is key across both desktop and mobile, and Guts has delivered the goods on both fronts. Variety is the name of the game at Guts Casino, and players can enjoy a mass of both video slots and classic slot games here. The eclectic nature of Guts’ slot titles is assured thanks to its partnerships with a wide variety of software providers, and as such there is an ever-evolving legion of slots to enjoy. These are handily categorised to accelerate the process of finding your next favourite title; simply browse by ‘Video’, ‘Classic’, ‘3D’ and ‘Jackpot’. Does Guts Casino Offer Progressive Jackpot Slots? Yes – a happy bunch of around 16 progressive jackpot slots are available that can and have paid out life-changing sums of money to players just like you. The jackpot slots available at Guts include familiar favourites such as Hall of Gods, Arabian Nights and Mega Fortune, amongst others, and each features a ticker outlining the current jackpot amount. It’s enough to make you feel a little giddy looking at all those numbers. Can Players Demo Guts Casino Slot Games for Free? There is a ton of free slots available at Guts; all of its games can be enjoyed in demo mode! Trying free slot games before parting with any cash is an excellent move, and could help you to gain an advantage when playing ‘for real’. Making a casino deposit at Guts is a piece of cake, and you will be gaming in no time here. Just enter your VISA, MasterCard, paysafecard, NETELLER, Skrill or EcoPayz details and let the depositing team do the rest. Withdrawing is simple too using the payment methods outlined above (note that MasterCard and EcoPayz are not eligible for a casino withdrawal here) or bank transfer. There are fees attached to making a withdrawal – check with your provider – with most processed within 1-3 days. What’s not to like about the Guts casino bonus for new players? Four deposit bonuses, worth up to a total of €300, plus 100 free spins on the timeless Starburst. There are plenty more offers and promotions up for grabs too. 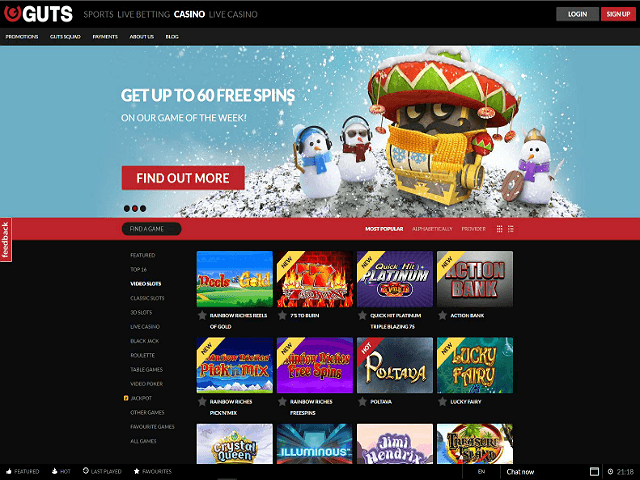 You cearn cashback each weekend by sampling the thrills and spills of the live casino, which is then paid directly into your account every Monday ahead of another week of gaming. 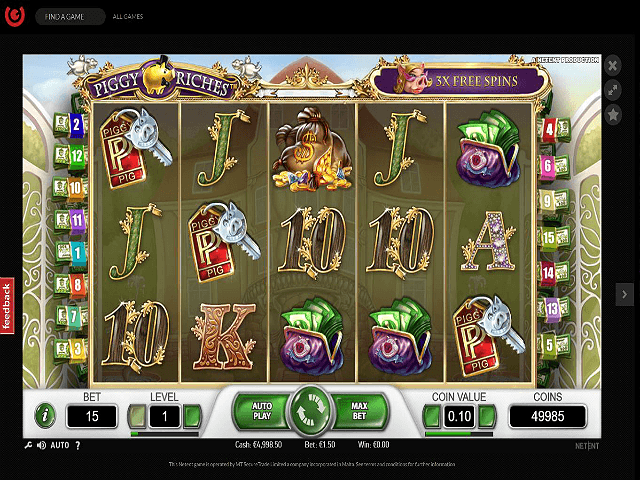 Loyal players are also handsomely rewarded with a bounty of free spins too. And why not bookend your week with Double Deal Monday (a 40% bonus up to €40 plus 15 free spins) and Thursday Triple? Make a deposit on any Thursday and unlock 60 free spins straight away. Don’t forget to join the Guts Squad too. This is the VIP scheme that offers loyalty bonuses, super-fast payouts and many more rewards, including cashback. A safe and secure gaming environment is provided by Guts, it utilises the latest SSL 256-bit encryption technology to ensure personal information and card details are kept private. Fairness is something that the UK Gambling Commission takes very seriously, and alongside eCOGRAa they ensure that fair gaming is upheld as part of the UK license requirements. Guts, in securing its license, has had to prove its worth in this area; giving their players complete peace of mind. One thing that must be mentioned is that Guts don’t make it easy to contact their customer support team. You could spend hours searching for contact details, and yet they are hidden away right in the footer of each page. Not advertised on the website is their email ([email protected]), while for Irish players there isn’t currently a telephone option. As mentioned, the main advantages of Guts Casino are that they simply tick all of the boxes of what a good online casino should be. There are cons to the pros of course and that is to be expected, but overall Guts is a solid choice for any discerning gamer. The verdict surrounding the brand is simple: you don’t need guts to sign up with this outstanding casino!